Meet Oz . . . he's got a talent for trouble but his heart's always in the right place (well, nearly always). Uprooted from his friends and former life, Oz finds himself stranded in the sleepy village of Slowleigh. When a joke backfires on the first day at his new school, Oz attracts the attention of Isobel Skinner, the school psycho - but that's just the beginning. After causing an accident that puts his mum in hospital, Oz isn't exactly popular at home either. His older sister's no help, but then she's got a problem of her own . . . one that's growing bigger by the day. Oz knows he's got to put things right, but life isn't that simple, especially when the only people still talking to you are a hobbit-obsessed kid and a voice in your own head! 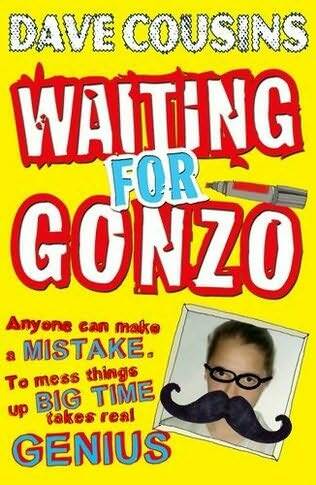 Packed with action, heart and humour, Waiting for Gonzo takes you for a white-knuckle ride on the Wheel of Destiny as it careers out of control down the Hillside of Inevitability. The question is, do you go down laughing? Or grit your teeth and jump off? I loved Dave Cousin's debut novel 15 Days Without A Head and he has hit the spot again with his hilarious second novel Waiting for Gonzo. Oz's life is turned upside down when his parents decide to move the family from London to the middle of nowhere. Oz and his sister, Meg, are far from happy about the move but neither of them was given a choice in the matter. All Oz wants is to move back to his old house so he can hang out with his friends and live the life he used to have but since that isn't an option he'll settle for getting through his first day at school without making an idiot of himself and for finding some new friends to make life in the sticks more bearable. When he draws a moustache and glasses on a photo displayed in the school corridor he is hoping people will find the joke amusing but he gets a lot more than he bargained for when he ends up with the school psycho on his tail. It isn't easy fitting in when you've already made a major enemy on your first day. Waiting for Gonzo is a comedy of errors, poor Oz goes from one disaster to the next as his life starts to spiral out of control. Who could have guessed that a simple moustache could cause him so many problems? As if his problems at school weren't bad enough Oz has uncovered a secret that Meg is desperate to keep hidden and he has no idea what to make of it all. Oz is such a fun character, the kind boy most of us knew as a child, one who works hard at being the funny guy but who is also kind hearted and just trying to find his place in life. I loved his developing friendship with Ryan but I think the best thing was the family dynamics between him and his sister. They fought like cats and dogs but they loved each other and Oz would do anything to look out for Meg. I love the way the story tackles some serious issues but it does it with humour throughout. 15 Days Without A Head was one of my favourite books on 2012 and Dave Cousins has definitely become a must read author for me, I can't recommend his books highly enough to anyone who is looking for a funny story with real heart and a great British feel to them.